Facebook users will be able to vote until noon Pacific/3 p.m. Eastern on December 10. The site is hosting a live online informational session Tuesday with company representatives to discuss the policy changes and answer user questions at 9:30 a.m. Pacific/12:30 p.m. Eastern on Facebook's Washington, D.C. page. Facebook is accepting questions about the proposed changes ahead of time on the same page. For Facebook to consider the vote binding, the social network requires 30 percent of all of its active registered users to vote. Facebook currently claims more than one billion active users per month, meaning that at least 300 million people would have to participate in the vote for it to be binding. That high a turnout seems unlikely considering about 0.1 percent of all active Facebook users participated in the most recent site governance vote in June. But it's not clear whether turnout was so low in June because of user indifference or if Facebook failed to notify users about the referendum in an effective manner. Facebook has not said whether it plans to notify users of the current vote. At issue beyond the right to vote are new data usage policies that would allow Facebook to share user information between Facebook-owned companies such as Instagram, and some clarifying language surrounding advertising and how your Facebook Timeline works. Facebook had originally proposed changes to how it allows you to filter incoming messages from Facebook users and pages, but this proposal appears to have been removed. Facebook's communications chief, Elliot Schrage, recently posted an explanatory note about the proposed changes and clarified the company's plans. “Our goal in modifying our site governance process is to make sure that we receive feedback from you in the best, most productive way possible so that we can be responsive to your input,” Schrage said referring to the proposed end of the user vote. 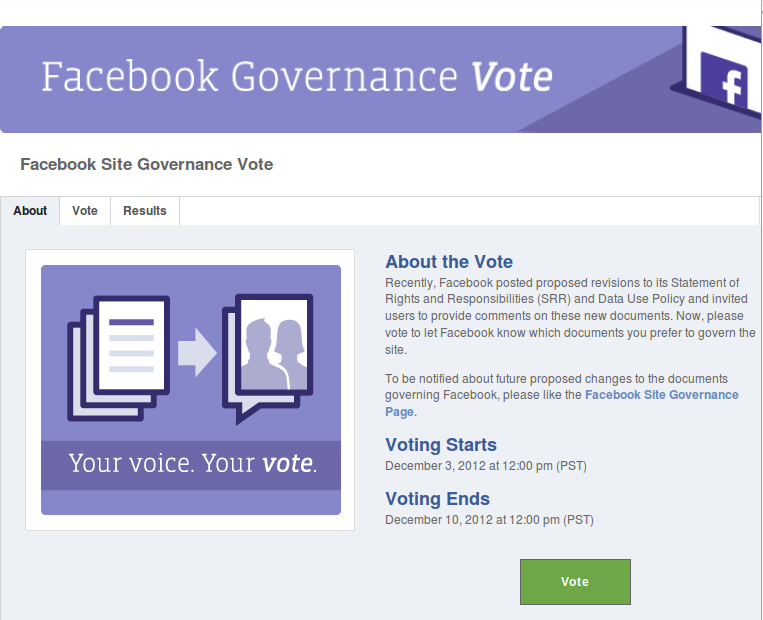 Instead of voting, Facebook will provide other mechanisms for users to participate in site governance such as user comments and direct questions to Facebook's privacy officer. While it's not clear whether Facebook users care about the social network's policy changes, other consumer interest groups do. The Office of the Irish Data Protection Commissioner asked Facebook to modify some of its proposals, which Facebook appears to have done. And two privacy groups, the Center for Digital Democracy and the Electronic Privacy Information Center in late November asked Facebook to rethink its proposed changes.